For many years, Solar Energy International (SEI) has been offering technical solar training for Tucson, Arizona residents and surrounding areas. Dozens of area renewable energy technicians and people working in the solar industry have gone through SEI's training program and are now some of the leading small business owners and leaders in the solar industry. On March 4th, SEI will be offering a week long training titled PV101: Solar Electric Design and Installation (Grid-Direct). Christopher Turek, Director of Online and Student Services for SEI pointed out, " SEI has been around before there was really even a formal industry of installers and manufactures. 20 years later, the industry has found legitimacy in the broader energy production sector and our educational organization has been there all along the way producing graduates who are ready for the technical demands found in solar energy. 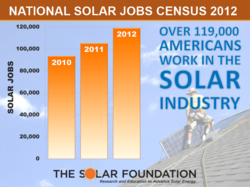 There are now more than 120,000 people working in the solar industry and there is a growing focus on a highly trained workforce. We hope people check out the full 2013 SEI solar training schedule to find a workshop or lab opportunity that will help them with their career goals." Jeff Spies, Vice President for Quick Mount PV, who lives in Chandler, Arizona explained how he chose his education through SEI, "After asking around and talking with other business owners in the solar industry, everyone I talked with told me to get my training from SEI. My education through SEI was a key to my success in the solar industry. They are always first on my list of training providers when I talk with people who are interested in entering this highly competitive industry." The March 4th solar training will provide an overview of the three basic PV system applications, primarily focusing on grid-direct systems. The goal of the course is to create a fundamental understanding of the core concepts necessary to work with all PV systems, including: system components, site analysis, PV module criteria, mounting solutions, safety, and commissioning. The course will also cover the basics of sizing a residential grid-direct system, wire sizing, overcurrent protection, and grounding – all of which will be expanded upon in more advanced courses later on in the SEI training program. Prerequisites: Before participating in the PV101 in-person workshop, students are required to complete the self-paced PV 101 PREP online component (included in price of PV101, you will automatically be enrolled in PV PREP Online at the time you register for PV101). This online component allows immediate access to start your solar education! Students receive access information shortly after registration for PV 101. PV 101 PREP enhances students’ learning experience and allows time to cover more information in the PV 101 course. The above objectives are covered in the mandatory PV101 PREP that must be completed before participating in a PV101 Solar Electric Design & Installation (Grid-Direct) workshop. PV101 PREP is an online, on-demand instructor-less course, which will require approximately 10-15 hours to complete and will help you be successful in our PV101 workshop.